There has been a bit of confusion on this very simple question, and I think I have answered this question about 50 times in various places internally and externally. Simply put when you get a vCloud Air Account, you already have access to a vCloud Connector Node on the vCloud Air side. You only need to deploy the vCloud Connector Server and Node on premises and register the vCloud Air node in your vCloud Connector Server. That being said there are various vCloud Connector Nodes. They are deployed anytime a new vCloud Director is deployed within vCloud Air. This means many people can all have different vCloud Connector Node addresses. It will vary by region, Dedicated Cloud, and Virtual Private Cloud. The good news is it is VERY easy to know what your vCloud Connector Node address is on the vCloud Air side. Simply log into your account, chose the Virtual Data Center you want and select “vCloud Director API URL” on the right side. 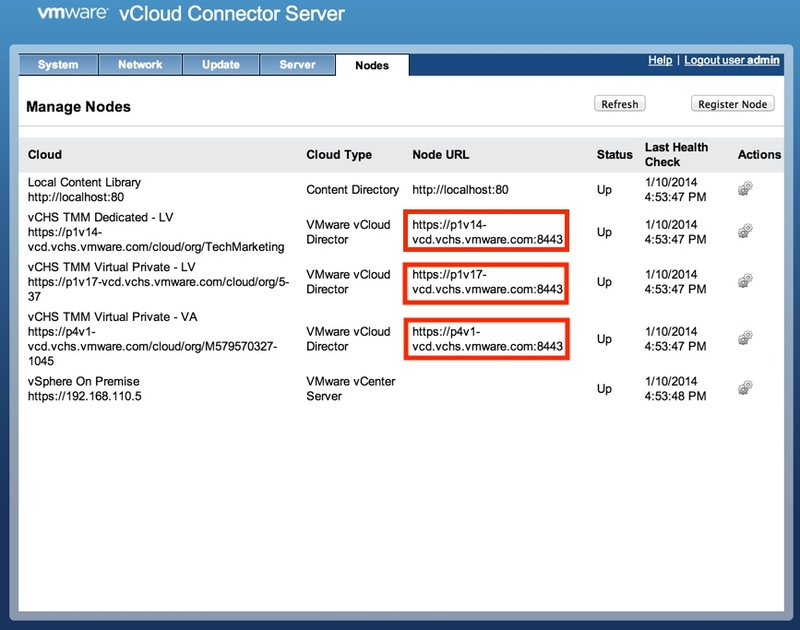 The vCloud Director API and the vCC node actually share the same IP address, they simply use different ports. The ONLY part of this you need is the http://pXXXX.-vcd.vmware.com. However, the PORT you will use for the vCloud Connector Node to register is NOT 443, it’s 8443. The vCloud Director Server and the vCloud Connector Node when deployed are using the same public IP address, but splitting duty on that IP address by Port number. So when you register in vCloud Connector Server you should use: http://pXXXX.-vcd.vmware.com:8443 as you can see from my vCloud Connector Server settings. If you have a Dedicated Cloud with multiple Virtual Data Centers this will be the same for ALL of them. If you have multiple Clouds with multiple regions you will want to get them all. You will need the section after /org to enter into the credentials section. Chris, thank you very much for clearing this up. 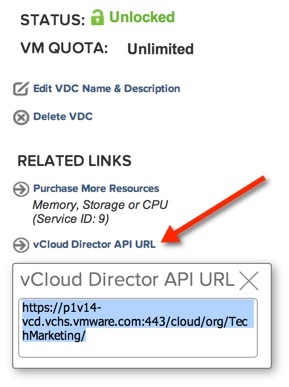 I have just installed vCloud Connector and was stumbling around the API URL provided by vCloud Air until I found your article. The documentation for vCloud Connector should probably include this tip as well. Last I heard it was supposed to have been updated/included in the documentation but I will go back and check with the tech pubs people.